Lightly deep-fry the sliced yam. Boil water in a pot. Put the meat into the water and boil for 10 to 15 minutes. 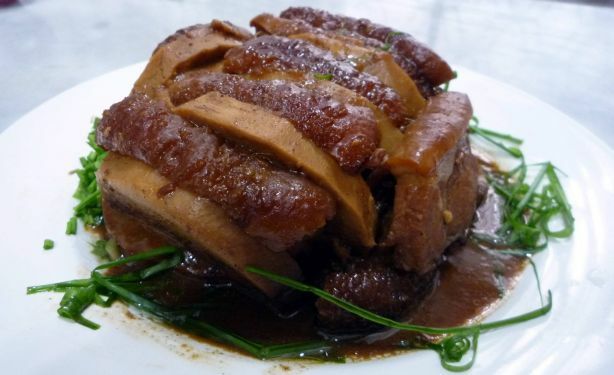 Pat dry the meat and brush it with one tablespoon of dark soy sauce, then deep-fry it until golden brown. Slice the meat thickly. Heat a few tablespoons of oil in a wok and stir-fry the chopped shallots and garlic. Add the meat, yam and fermented red bean curd. Season with two tablespoons of dark soy sauce, one tablespoon of light soy sauce, one tablespoon of oyster sauce, a pinch of five-spice powder, pepper and sesame oil. Arrange the slices of meat and yam alternately in a bowl. To serve, invert the bowl onto a serving plate lined with lettuce leaves.